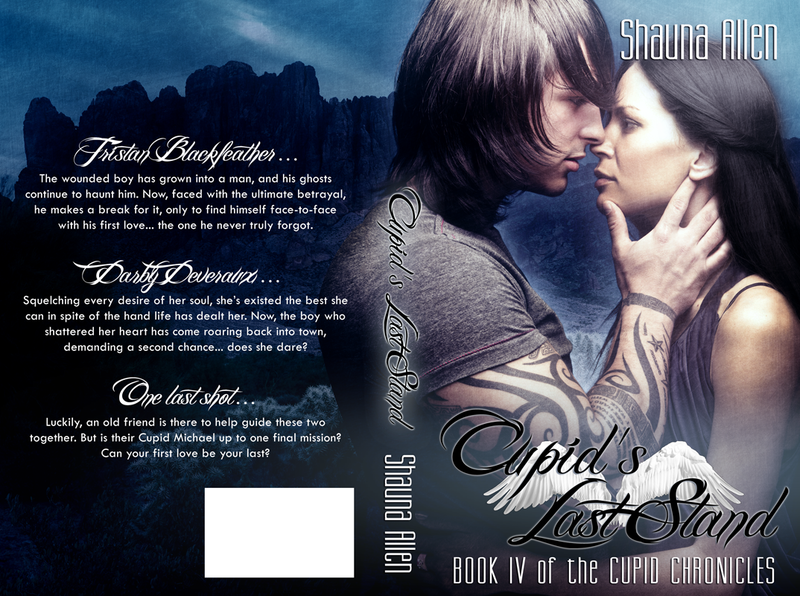 CUPID’S LAST STAND the fourth and final book in the Cupid’s Chronicles Series by Shauna Allen is finally here! Tristan Blackfeather . . . The wounded boy has grown into a man, and his ghosts continue to haunt him. Now, faced with the ultimate betrayal, he makes a break for it, only to find himself face-to-face with his first love . . . the one he never truly forgot. Darby Deveraux . . . Squelching every desire of her soul, she’s existed the best she can in spite of the hand life has dealt her. Now, the boy who shattered her heart has come roaring back into town, demanding a second chance . . . does she dare. One last shot . . . Luckily, an old friend is there to help guide these two together. But is their Cupid Michael up to one final mission? Can your first love be your last? **Join Shauna Allen’s Facebook party on June 24th to celebrate the release day of Cupid’s Last Stand! Join the party here! Some stupid part of him wanted her to say she remembered every single thing about that summer. That she wanted it back. Wanted it all . . . wanted him. But he knew that could never be. He wasn’t the kind of man that women loved like that. He was not worthy; he was infinitely flawed—had known it since his dad left him, and most especially when Darby had first been thrown into his stratosphere as the ultimate tease. Mallory only served as an exclamation point. It was Darby. Had always been Darby. Looking at her now, he knew it. “Why, what?” He placed the teabag on the counter. He cupped her face and brought his lips to hers, shushing her words. He’d been waiting to do this since he first laid eyes on her in the Red Cross building . . . hell, maybe since he left her ten years ago. She froze, her body rigid and tight as emotion thrummed between them. Then, as if a dam burst, she clutched at his shirt and yanked him closer as a mewling moan ripped from her throat and she allowed his tongue to slide in and twirl with hers. He tilted his head and deepened the kiss as far as he could, allowing every ounce of her to intoxicate him. He traced his fingertips down her throat, feeling the restless pounding of her pulse. Ten years might as well have been ten seconds as it all came crashing down on them. He pressed her back against the countertop, fitting their pelvises together snugly, drawing a low groan from her as her nails raked down his back. He sucked her tongue into his mouth, nibbled her lower lip. He’d eat her alive if he could. She was everything he needed to live in this moment. And she seemed to consume him in kind as her fingers moved greedily through his hair, holding him closer still. She rested her cheek back to his chest. He didn’t say anything, not sure what else to say. He’d been a teenage kid. Sure, he’d promised her the moon, and sure, he’d been head over heels for her, but what did she expect? She hadn’t acknowledged one of his letters or calls. Life went on and heartbreak was a two-way street. He’d just sucked his up and bottled it away. “Yeah.” She drew back and met his eyes, her arms still linked around his waist. Once again Shauna Allen has kept me up way into the night reading because I simply could not put down this book. I was so caught up in this sweet, beautifully written, second chance love story of how Tristan and Darby, both with wounded, aching hearts find their way back to each other as adults after being separated as teenagers. 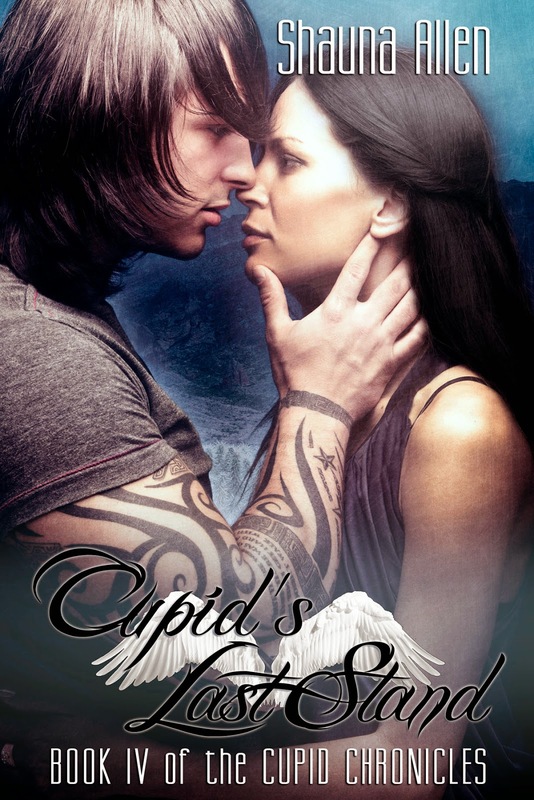 CUPID’S LAST STAND is the fourth and last installment in The Cupid Chronicles series and I haven’t had a chance to read all of the others yet, but I can assure you this one was a pleasure. The story begins with an earthquake shaking up Darby and her quiet little Arizona town creating a need to tear down those old stubborn walls and build something new. Just like Darby needed to make some changes in her own life, take back control and get out from under the sorrow and grieving from her past. Tristan too was at a place for making a fresh start. He’s been left at the altar which merely confirms to him his long held belief he is unlovable and anyone he cares about will eventually leave him when they realize this. When he hears of the extensive damage caused by the earthquake back in New Destiny, his heart (and the influence of a certain angel in the love detail) leads him to the small town to offer his help. New Destiny is where he first met Darby as a sixteen year old boy and fell completely in love. When they meet again after ten years of each of them believing the other didn’t care enough to keep the promises they made to each other, the fire and attraction between Tristan and Darby is just as strong as ever. At first they’re angry and their wounded emotions get in the way, but circumstances and their intense desire for each other draw them together again and again until they finally talk things out. Discovering things weren’t quite as they seemed helps in getting over the hurt of the past, but that is not the only thing between them. Darby is committed to her life in New Destiny and Tristan is headed to California to fulfill his lifelong dream of owning his own motorcycle shop. Seems they are destined for a short, blissful time together only to be separated again. Darby is a beautiful, strong woman focused on making a success of her family’s a construction company. She carries on despite a chronic illness, an unsupportive mother, and still grieving the recent death of her father. There’s so much to admire about her. As I said, I could not stop reading. I had to know how they worked it out. Had to know that Tristan could finally recognize he not only could be loved, deserved to be loved, but that he was loved. I had to know that Tristan realizes he’s found something special with Darby that just may be a once in a lifetime thing. Twice. I had to know that he man’s up! I knew it would happen, because Shauna Allen does not disappoint if you are looking for a love story that will make you laugh and touch your heart and leave you feeling like you’ve had your own HEA when the story is finished. In Cupid’s Last Stand she not only shares with us Tristan and Darby’s love story, she also gives us a secondary story. Ryan, one of the friends Tristan brings along with him to work on rebuilding the town falls hard for Kai, Darby’s best friend. Fortunately for Ryan Kai is just as smitten with him. Of course, they also had their troubles to overcome before they could be together, but that only added to the richness and enjoyment of this wonderful story as a whole. Loved this book! I recommend it to anyone with even just a tiny romantic bone in their body. 4.5 stars. Tattoos, cupids, and bad boys: Shauna Allen delivers one heck of a read. Fresh, sassy, and witty—she brings a new voice to romance that readers are gonna love! A charming romance from start to finish. Shauna Allen’s fresh, new voice makes Inked by an Angel a must read. The Halo Effect . . . doesn’t disappoint. 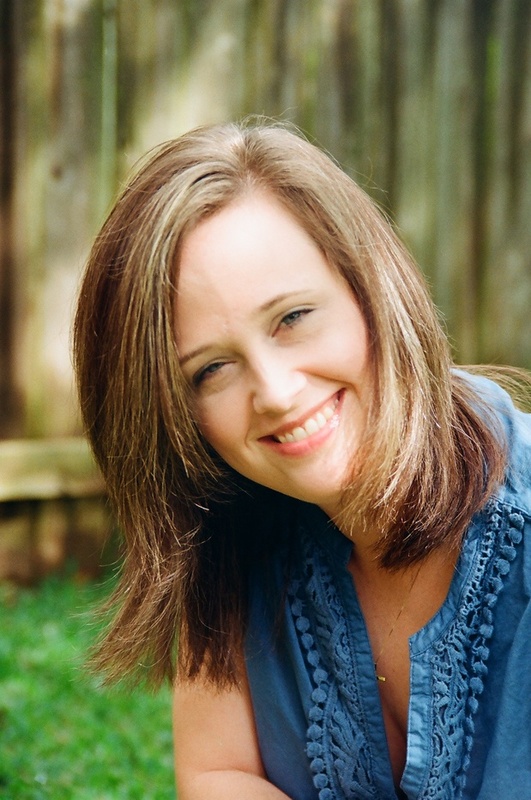 Shauna has an amazing ability to write compelling characters that are real and relatable. With a cupid in the mix love finds a way to conquer all things . . . I must say that I loved the book and the characters in the book. I hope we see more from this talented author. reminds us that love exists in the unlikeliest places, and that we may need a “guardian angel” to help us find what was meant to be all along. Holy smoke! Shauna Allen has done it again! I fell in love with the Cupid Chronicles from the first book and that was it for me . . . Shauna did not disappoint with Wounded Wings and from the first two sentences I kid you not I was in love. Thanks so much Kimberly! She’s a great writer!